It is said that the human brain consists of 2 parts, the left and the right hemisphere. The left brain is used in logical thinking and analytical processes. The right brain is used in emotional perception, intuition and creativity. It is the right brain that is mainly used when a person is involved in creative activities. It is scientifically shown that when particularly gifted children solve problems, there is increased electrical activity in both hemispheres. It appears that for the brain to function with the most efficiency, the two hemispheres of the brains must work together. This requires exposure to a range of tasks that incorporate logical thinking and the arts/creativity. Children are regularly exposed to activity that develops logical thinking and analytical processes, and children must also be exposed to the arts, creativity and free-play as their cognitive skills mature – so that their right brain will be developed as the left develops also. It is important that children have access to artistic opportunities to be able to learn to have creative problem solving abilities and critical thinking. Parents and educators can also be creative in how the child accesses such opportunities; providing ready access to playful art tasks and equipment is a good starting point. 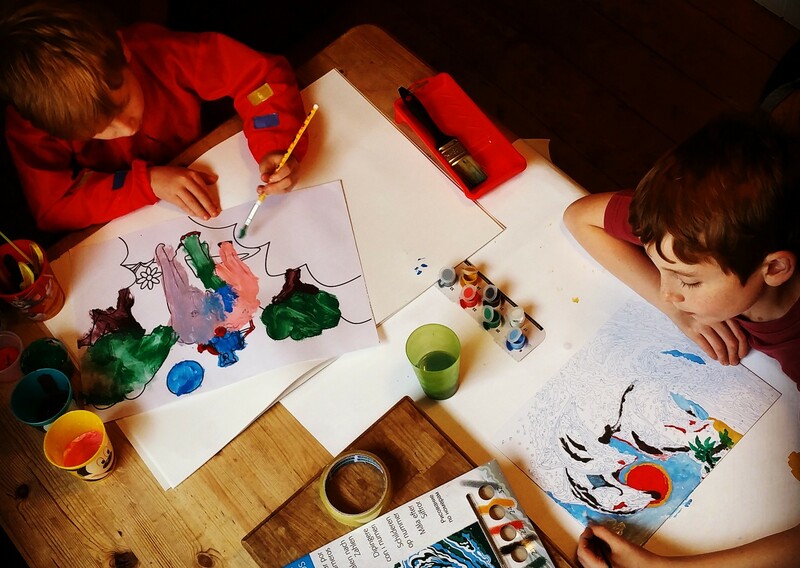 So whatever their age, get those paintbrushes, crayons, glitter glues out ready and let your children develop in their own creativity …..